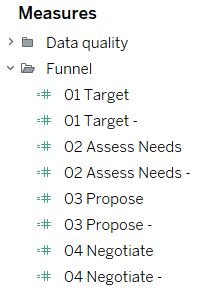 A funnel—also called a pipeline, a sales process or a cycle—can be used to bring significant clarity to your sales data. 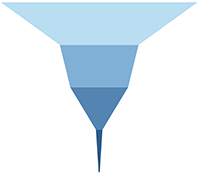 Whether you’re interested in identifying customers who are dropping out of the sales process, understanding your buyers’ purchase journey, or visualizing whether you have enough prospects to achieve a sales target, you can do it with a funnel. 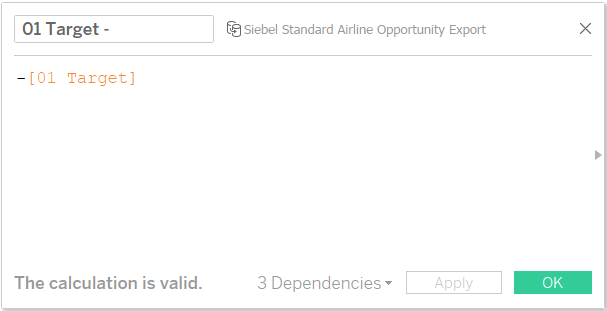 Five years ago, I created my first funnel in Tableau to analyze an airline e-commerce website funnel. Recently, I’ve been asked to visualize our company’s sales pipeline, so I had the opportunity to explore alternative ways to visualize a funnel. You want a funnel shape, not bars on top of each other. You want each step differentiated with color. 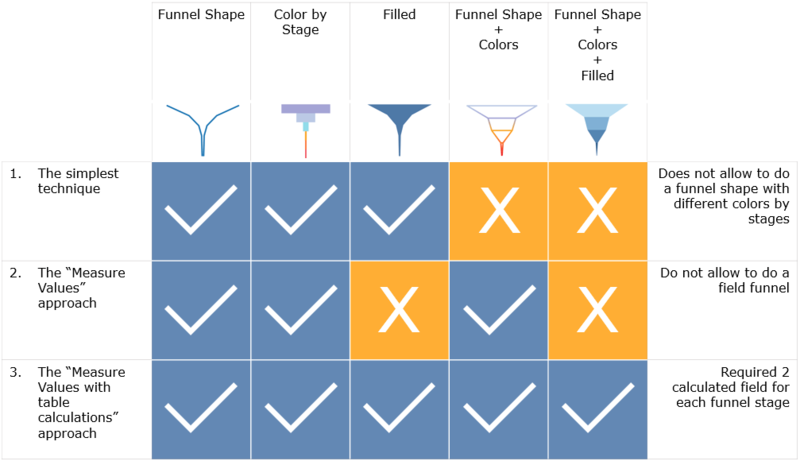 You want your funnel segmented and filled with color. 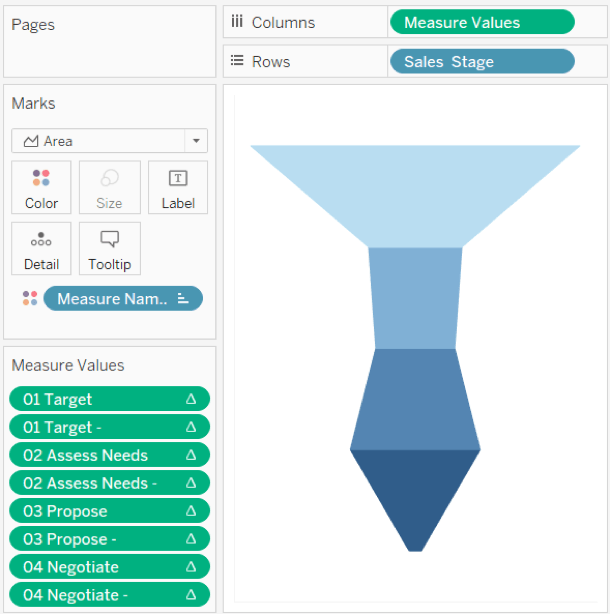 There are many ways to create a funnel viz using Tableau, but in this article I’ll focus on the three described above. This is the simplest way to create a bar or a line funnel with different colors or a funnel shape with no separations between the steps. 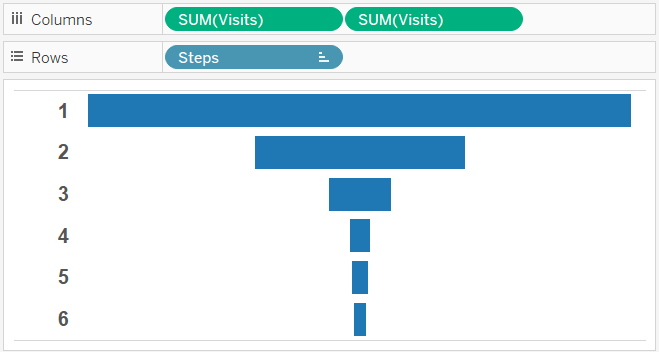 It’s one of the first vizzes I created in Tableau—thanks to this tutorial. 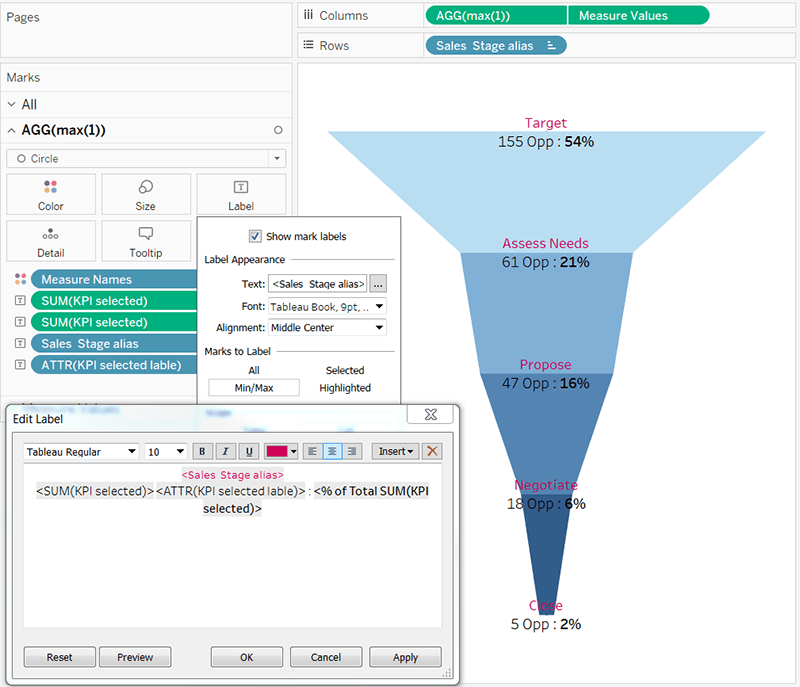 Duplicate the measure you want to use to visualize with the funnel (customers, revenue, visits). Put the two measures on the column shelf. 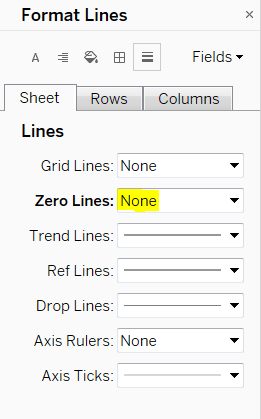 Don’t forget to customize your formatting to get rid of any lines—especially the column dividers and the Zero Line that would otherwise divide your funnel in two. 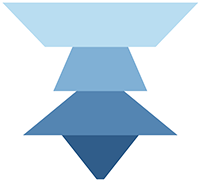 Use this approach for a funnel shape with differentiated steps. 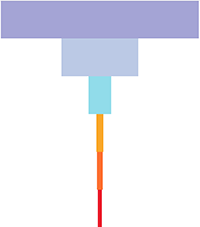 This approach is the most advanced, but it’s not complicated if you want a filled funnel shape with steps differentiated by color. 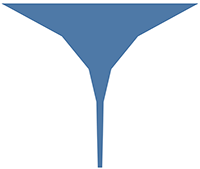 Thanks to Adam’s blog post I learned to draw a real funnel, but when I wanted to have a filled funnel shape, I struggled. This is when I found a post by Rajeev Pandey on Tableau Community. He suggests creating two calculated fields for each funnel stage or step, so I don’t recommend this technique if you think that you may add a stage in the future; your dashboard will not detect the new stage automatically and you would need to add two calculated fields to detect the new stage. 1. 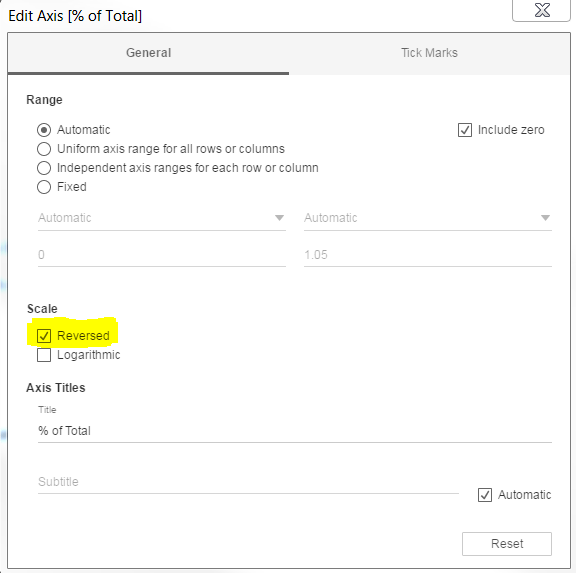 Create two calculated fields for your first funnel stage. 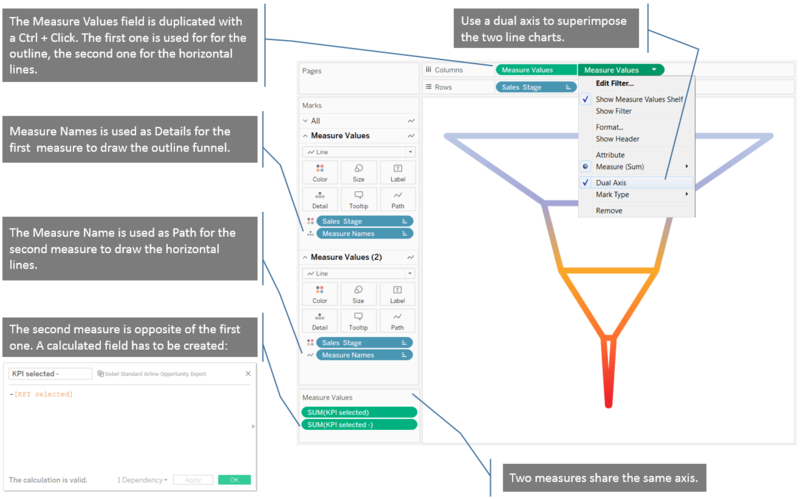 Knowing how to create funnels in Tableau is a useful, foundational skill with many interesting applications. Use the table below to help you to find the approach that is most appropriate for your goals. 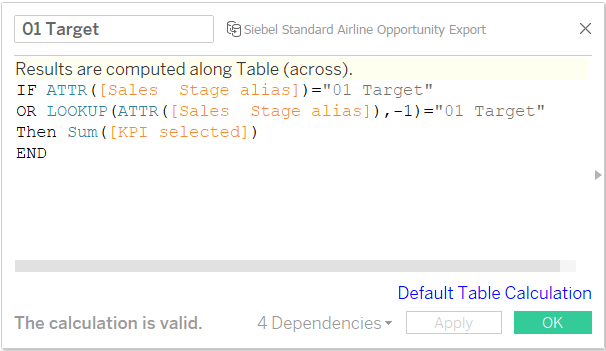 Find more of Yvan’s tips, tricks, and vizzes on his Tableau Public page—and be sure to connect with him on Twitter @YvanFornes.